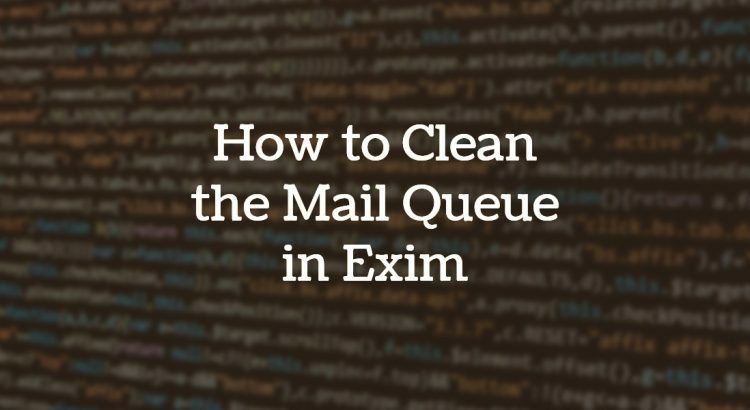 In this tutorial, we will take a look at how we can clean our mail queue in Exim. Exim is a free and versatile mail transfer agent (MTA) that has been ported to most Unix-like systems and is currently the default for a few Linux distributions, most popular being the Debian Linux distribution. Exim is widely used around the world, and it is estimated that around 56% of the publicly available servers on the internet use Exim as their mail transfer agent. As we’ve seen above, the first command (exim -bp) lists all the messages we have in the mail queue, the second command (exiqgrep -i) grabs only the message id’s from the first command and the third command (xargs exim -Mrm) passes the message id’s returned from the second command to the command (exim -Mrm) that is used to delete messages from the queue. This will force Exim to send every message in the mail queue regardless of whether it is frozen or not. That’s it, you have now successfully cleaned your mail queue. Of course, you don’t have to do any of this if you use one of our Service Configuration & Optimization services, in which case you can simply ask our expert Linux admins to do this for you. They are available 24×7 and will take care of your request immediately.